In the past few years, optical atomic clocks have made spectacular progress, becoming 100 times more precise than the best caesium clocks. So far, their precision has been available only locally, since frequency transfer via satellite cannot provide sufficient resolution. This has recently changed thanks to a new direct optical connection between France and Germany, established by joint work of Physikalisch-Technische Bundesanstalt (PTB) in Braunschweig, Systèmes de Référence Temps-Espace (LNE-SYRTE) in Paris, and Laboratoire de Physique des Lasers (LPL) in Villetaneuse. 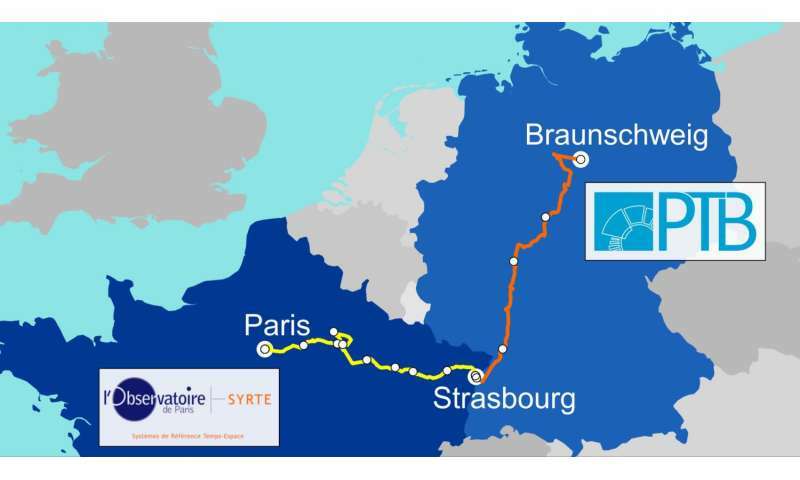 High-precision optical frequencies can now "travel" through a 1400 km optical fibre link between LNE-SYRTE and PTB, where the most precise optical clocks in Europe are operated. The first comparison between the French and German optical strontium clocks confirms the high expectations placed in the connection. It represents the first frequency comparison of its kind across national borders: the fully independent clocks agree with an unrivalled fractional uncertainty of 5 × 10e-17. The scientists report their results in the current issue of Nature Communications. Their successful collaboration is a first step towards a European network of optical clocks providing ultrastable high-precision optical reference signals to diverse users. This will benefit various research areas, with applications in fundamental physics, astrophysics and geoscience. Comparisons of clocks at the highest resolution allow a wide range of very sensitive physical experiments, for instance, the search for time-dependent changes of fundamental constants. Also, the apparent rate of a clock depends on the local gravitational potential: comparing two clocks measures the gravitational redshift between them, and thus yields their height difference. Such measurements provide data points for the geodetic reference surface, the so-called "geoid". This research approach is pursued jointly by physicists and geodesists in the Collaborative Research Centre 1128 ("geo-Q") of the German Science Foundation (DFG). Today's most precise atomic clocks are based on optical transitions. Such optical clocks can provide a stable frequency with a fractional uncertainty of only a few 10e-18. This is approximately 100 times more precise than the best caesium fountain clocks, which realize the unit of time, the SI second. However, clock comparisons using frequency transfer via satellites are limited to a frequency resolution near 10e-16. For this reason, scientists from PTB and from two French institutes in Paris (Systèmes de Référence Temps-Espace, LNE-SYRTE and Laboratoire de Physique des Lasers, LPL) have been working for several years on an optical fibre connection between the German and the French national metrology institutes, PTB and LNE-SYRTE. The 1400 km long link is now completed: it is based on standard telecom optical fibres and optical power losses of 200 dB (10e20) are compensated by means of specially developed amplifiers. Furthermore, frequency fluctuations added during the propagation along the fibre are actively suppressed by up to 6 orders of magnitude. This allows the transmission of optical signals with very high stability. The German part of the link uses commercially rented optical fibres and facilities of the German National Research and Education Network (DFN). The French part of the link uses the network for Education and Research RENATER, operated by the GIP RENATER. Approximately midway, signals from LNE-SYRTE and PTB meet at the IT Centre of the University of Strasbourg, so that the clocks of the two institutes can be compared there. The partners involved are: Physikalisch-Technische Bundesanstalt (PTB), Institut für Erdmessung (IfE) der Leibniz-Universität Hannover, Laboratoire de Physique des Lasers (Université Paris 13/Sorbonne Paris Cité/CNRS), LNE-SYRTE (Observatoire de Paris/PSL Research University/CNRS/Sorbonne Université/UPMC Univ. Paris 6/Laboratoire National de Métrologie et d'Essais), and the GIP RENATER (CNRS, CPU, CEA, INRIA, CNES, INRA, INSERM, ONERA, CIRAD, IRSTEA, IRD, BRGM, and the MESR). In a first comparison using the most stable optical clocks of PTB and LNE-SYRTE, the link lived up to the high expectations. Frequency fluctuations between the two strontium optical lattice clocks of less than 2×10e-17 were observed after only 2000 s of averaging time, and the link itself supports fast clock comparisons with an uncertainty below 10e-18. As both clocks are based on the same atomic transition they should theoretically supply exactly the same frequency - except for the gravitational redshift due to the 25 m difference in height between the two institutes. This was indeed confirmed within the clocks' combined uncertainty of 5×10e-17, corresponding to a height uncertainty of only 0.5 m.
The partners consider this successful collaboration the first important step towards a European network of optical clocks connected by optical fibre links which could successively be joined by the optical clocks of further European metrology institutes. This should place them in a leading role for the dissemination of optical reference frequencies. As a long-term perspective, such a network may provide ultrastable high-precision optical reference signals (like those currently available from metrology institutes) to a broad range of users. Various research areas will benefit from this, including fundamental research (to test the fundamental laws of physics), geoscience and, last but not least, metrology. This work also clears the path towards a redefinition of the unit of time, the SI second, through regular international comparisons of optical clocks. the search for time-dependent changes of fundamental constants. That is one of those ideas that always freaks me out a little. Forget asteroid impacts or other such 'low level' catastrophes. Fundamental constants drifting is a thing that you're just completely helpless against. (probably why I love the move 'Quiet Earth' so much...it has that idea at its core). But boy, if it ever turns out that these constants aren't as constant as we think they are then that's where we'll get truly New Physics (which rightfully deserves the capital letters). I have expressed problems with the "scientific" wordings on this site before. When they state "fractional uncertainty of only a few 10e-18", does this mean 10^-18 (which is state of the art), or does the e mean the natural exponent, 10*e-18 = 1.52E-7? I am certain it is the former, but it would be nice if this site would edit their reports.